There I stood in the cereal aisle at Walmart when another woman approached me. She began complimenting our foster princess on her well-behaved manners before pointing out her beautiful blonde curls that were tucked so neatly behind her pink bow. She began questioning where she got her hair since it is so much different from mine. And that’s when I began telling this very sweet woman that her gorgeous blonde locks didn’t come from me. Nor did they come from my handsome husband. In fact, they came from her momma as she is our beautiful foster child. Immediately the woman began telling me I was “a saint” as she could never open herself up to such heartache and uncertainty. She even went on to say, “I have always wanted to become a foster parent, but it would be too hard for me.” To which I nodded. Because I get it. I understand. I too have said her words. Because the thing is? She is right. And I was right. 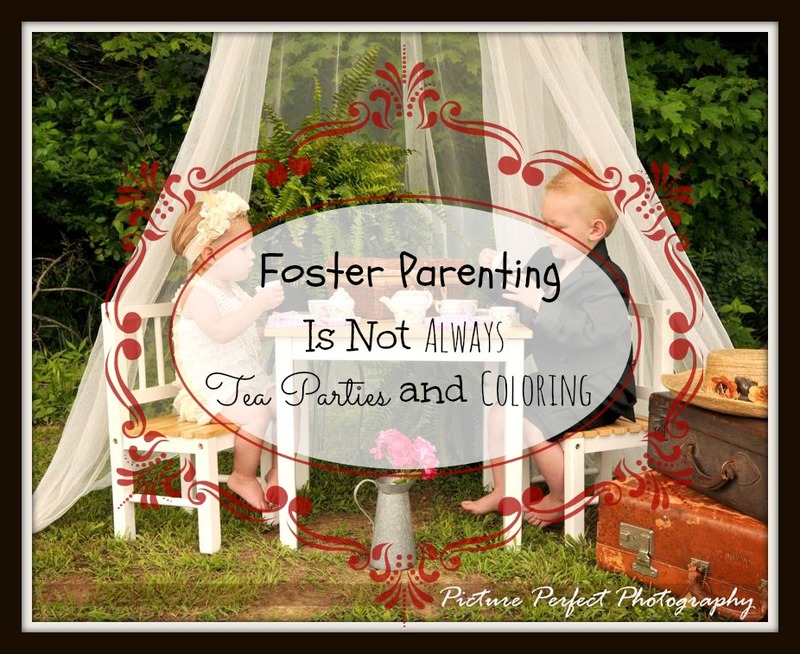 Foster parenting is not always tea parties and coloring. It is hard. It’s hard to go from a calm, flowing, and efficient schedule to one of chaos. It’s hard voluntarily allowing a child into your home who has lice, bed bugs or worse. It’s hard unpacking their belongings out of a trash bag and trying to hold back the tears. It’s hard finding a place to tuck away the gut wrenching story in your brain so that you don’t have an emotional breakdown every time you look into their eyes. It’s hard to not scoop them up and try to save them from this world that is treating them unfairly. It’s hard to pray for their parents and not hate them when you read the allegations on court documents. It’s hard scheduling and completing the mandatory doctor, dental and vision appointments within the first 30 days of placement. It’s hard hearing a child tell you horrific stories they should never know, let alone have experienced. It’s hard consoling them as they cry for their parents who you believe should be put in prison for the decisions they have made. It’s hard waking up for the fourth time in the night because they have had yet another nightmare. It’s hard trying to not say or do the wrong thing that might cause them to blow up in public. It’s hard having case workers, child advocates and other social services parade through your home unannounced on a weekly basis and scrutinize you in ways no one does for a biological child. It’s hard because these visits could be at 8:30 in the morning or 8:30 in the evening. It’s hard standing in the court room face to face with their parents. Is the mother mad at me? Is she grateful? Dare you make eye contact or just look at the floor? It’s hard not ever knowing what to expect and living a life of uncertainty. It’s hard and even heartbreaking. But can I tell you something else? The chaos? The unannounced visits? The never-ending doctor appointments? The awkward parent meetings? Court hearings? And middle of the night cries? They are all worth it to see even one of their smiles. To feel just one of their warm hugs. Hear even the slightest sound of their laughter. Or catch a glimpse into their gentle eyes. Foster parenting is hard. But it’s also worth it. Because love? Love is always worth it. I think this rings so true for stepparents as well. We have to teach children they can never have too many people that love them, while sharing them with those people. Fostering, step parenting, mentoring, there are so many kinds of being a parent. No one is less important than another in the eyes of the child who looks up to you. Everything about parenting is hard, but everything is worth it. No-one ever promised that life would be easy (or at least no smart person ever did). Life will be hard, and some moments will even be excruciatingly hard. But, what I do know, and what you and your husband exhibit, is that life will have champions who stand up for those who cannot and offer love and support to those who need it. I have no doubt that the long term results of showing goldilocks these virtues is undeniably worth every single moment of heartache and annoyance you experience. Opening yourselves up to heartache and public scrutiny is no-doubt hard, but doing so is such a great act of love for a little girl who deserves as much. It’s sad that you are put through so much scrutiny when biological parents aren’t. Wouldn’t this world be a different place if every parent had to answer for their actions. I have heard so many horrifying foster parenting stories. It makes me happy to know that you and your husband are the definition of what an ideal foster family is like – loving, caring and most of all – appreciative of the gift you have been given, even if the task is the hardest of them all. Thank you so much Amie! It’s such a bittersweet situation for us. We know that she is having a great time here, but at the same time when she returns home (even if the environment is better than before) it won’t be anything like the structure and stability we have provided for her here. I don’t want her to always think back to that time she lived here and miss it to the point of ruining her childhood/adolescent life. Does that make sense? It’s so stinkin hard. lol! That’s so true! Wow I didn’t think of it that way. Thanks so much girlie for the sweet compliments! Sometimes hearing that we are doing a good job with her can go a long way. This is beautiful. I especially like your last two lines–“It’s hard but I can tell you it’s worth it. Love is always worth it.” That rings true from our relationship with God to those with our spouses and families to the love you have for your child. This is awesome! You’re following your calling and that is a beautiful, beautiful thing! Thanks girlie! I am not sure if it was my “Calling” in the sense that I didn’t know it…but I think that no matter what, God always equips us to do His will. He is fo’ sho’ equipping me because it’s not by my strength I am able to do this, but rather by His. You are doing such an amazing job with Goldilocks. She is lucky to have been placed with you and hubby. Fostering isn’t hard and yet you make it look so easy. Thanks girl! But I think if you followed me around for a day you would see that I don’t make this easy at all. bahahahaha! You and your hubby are so wonderful, god bless Goldilocks that she has found you and your family. Big hugs! God bless you. Goldilocks sounds pretty lucky to Me. I think we are the lucky ones most of the time. She teaches me so much about how Jesus must love us. Beautiful post. I think what you and your husband are doing is amazing. Thank you for all that you do. ❤ I know you are making a HUGE difference. lovely post! i’m in awe of you and the many parents i’ve come across who have done the same in my practice. Awe thank you sugars. It’s not easy but I know that the Lord is giving me the wisdom, understanding and strength to do what I never thought I would do. I wish all foster parents, parents, step parents thought like you do. I believe we would have some well raised children. I work for a social services department. I just do their accounting but I can say not all foster parents have your heart and I wish they did. I had no idea you wer a Foster Parent! If we could stay in one place forever…I would like to be. But.I also get so attached..and my heart would break if we had to move..because I would feel like we were just breaking their hearts as well. BUT I do know that..for a few moments…they would always remember us, knowing that we cared. But.I just can’t. I’m already devestated that we have to wait to adopt. Goldilocks is so lucky to have you!! Beautiful post! I love how clearly you identify the difficulties, while equally clearly identifying the joys. It’s so important to remember that most relationships will never be all tea parties and colouring, but that doesn’t mean it’s not worth it. I’m glad Goldilocks has you in her life – a positive role model is so important to a child, especially one who has experience trauma. I hope you get many more days of tea parties and colouring with her :-). Elisha, you emulate such beauty!! Your post brought me to tears, but so many of them such happy tears for those who have found you as a foster parent. Prayers for strength and grace to cover you. May your love forever be etched into their hearts. This is beautiful. I can only begin to imagine how hard it is, but I can also only begin to imagine what a blessing your love is to this little girl and others, as well as their families. We have friends who are foster parents and it has been a wonderful and humbling and heart wrenching journey to experience alongside them. You have such an amazing heart and soul. I’m thankful you share your thoughts in this space. Hugs! The statement about being worried what would happen to her if you weren’t there….you got me there. Drying my tears here! You already know this, but I think you are one of the most amazing women ever! I think you are just awesome, Elisha! That’s all. I just wanted to tell you that. This is a beautiful post, we got our K about 2 months ago and there are many people that will tell me how awesome we are doing. But little do they know all the hard stuff that happens at home when we aren’t in public. It is hard most days with all the changes going on all the while we are praying for God to answer our prayers for a baby of our own.